Please see this page of Google Places User Guide for examples of acceptable custom attributes. Google typically prefers to provide less rather than more guidance in the quality guidelines unless there is significant abuse, a significant decline in end user experience and/or a ranking penalty. This update is consistent with the geo-spamming penalties we have seen in the past. Obviously if you are in Columbus Oh, Google already knows that and including the phrase in the description and custom fields has no purpose other than to “fool” Google. It is unclear to me though, what situations this new rule applies to besides the excessive use of geographic terms. I see some difficulties with the guideline as well. If a business title includes the word physician, the category is also physician, might it not make sense to perhaps include the word physician in the description (i.e. Dr. Alvarez is a caring physician) and perhaps in the custom attributes as well to describe additional medical practices performed that didn’t fit in the 5 categories? You thoughts on this change and its import? Google Maps and the QR Code – Why Use Google’s? I think all of those ideas are excellent although a few years ahead of the market. I laud Google for its creative use of the code and for their creative marketing of it. But I would ask, if you are going to use a QR Code in your marketing, why use Google’s? It is dead on simple to create your own at a number of sites. Here is the code that I generated from the first result in Google. Google Maps Guide Brianna (highlighted by Barry Schwartz) noted in the new forums that restaurants (and hotels) can add discreet links to menus and reservations. This is done by adding a field with a specific label (either Menus or Reservations) to the Additional Details section of your Places account and inserting the appropriate URL. 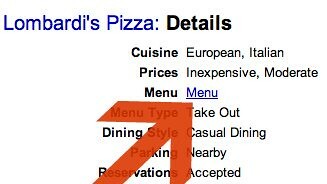 You can see an example of a linked Additional Detail field in the Place Page listing for Lombardi’s Pizza. It is unclear how much traffic come from deep in a Places Page. I doubt very much. What is intrigueing is that now we might be able to tell. It will be a simple matter to create a vanity url for the reservations and menu pages that will track the local traffic that is being sent. Obviously the Additional Details fields support a number of phrases that trigger the distinct links. I wonder what other specific tags might also trigger the results? Yesterday, I criticized Google for removing the Verification Issues Topic from the forums. Verification issues are a very obvious point of friction between the SMB and Local Business Center Google Places management area. Verification after the phone call or post card is requested, goes wrong often enough that a number of SMBs are left without an active listing and not a clue as to how to proceed. The forums never offered a great way to solve the issue as only Google could “fix it”. Yesterday, after my post, Google correctly pointed out that they were now offering up a direct contact form for resolution of verification issues as “The reason we ‘took away’ the verification forum”. I stand corrected and laud the fact that there is actually a contact form in place! Google Places – Will Customer Service Decline Further? As part of Google’s rebranding of the Local Business Center to Google Places, they have created a new help area and a totally new forum area for uses of the Google Places center. The forum move is particularly dramatic and likely to be very disruptive. Google has archived the very active threads relating to LBC issues and replaced them with a single thread. On the one hand, breaking out the recreational and business users of Maps makes sense. The removal of categories dealing with the many problems that users confront in the Google Places center rather than fixing the issues or answering them seems very counterproductive. The verbiage of the the last new forum group is particularly illustrative: Discuss Google Places issues with other users. It seems to make perfectly clear, that despite the many problems and issues with flaggings & the verification process that only Google can solve, a user will not be able to expect help from Google. The changed name and the fact that no link exists to the forum from within the Google Places work area means, that at least for a while, the volume of requests for help will be quite a bit lower. It will also make the job for those contributing their time in the forums more difficult. The old forums, although archived are still accepting posts and do not yet redirect to the new areas. Given that more businesses will be participating in paid aspects of the business listing process, it would seem that their expectation of service will only increase. Google’s quest for a scalable support solution seems to have a taken a step backwards. If the new Google Places offers significantly better advice when problem with the ever mysterious flagging occur, fewer issues with verification then perhaps or significantly few bugs, Google could get by with a lower level of customer support. It is not at all clear to me that this has happened. New features yes, bug fixes? Probably not. Until such time as the process of entering a business in the Google Places process is much smoother, Google will only further anger the many participants of the product that run into roadblocks. I used to think that Google “just doesn’t get customer support”. My new thinking is that they get it just fine, they just are not interested in providing any. Correction 8:50 am: Google “inadvertently included the wrong screenshot on the press site – the image of the dashboard featuring the option to add a map and download KML. We’re always testing features internally and may or may not release them; we didn’t intend to indicate that we were launching these features”. -Expanded availability and rebranded their fixed price enhanced listing feature as “Tags”. It appears to have moved from a test to a permanent foray into a simple fixed priced ($25/mo) SMB product. –Added the ability for business owners to more easily generate KML files and Location maps for their websites from within the Dashboard. Google also noted that over 2 million businesses in the US (4 million worldwide) have claimed their listings with Google and that 20% of searches on Google are related to location (somewhere close to 2 billion a month) . That amounts to roughly one in every 7 businesses that have claimed their business listing. While the announcement may seem to some a simple rebranding or a minor upgrade, it may be more than it appears on the surface. More business marketing and engagement: By creating a single brand that unifies Places Pages and the claiming process, Google is attempting to make the process more obvious to SMBs. They are also offering an overview webinar and outreach on the business photo shoot participation. Clearly over the past year, Google has been making an attempt to educate and engage SMBs in the claiming process and that seems to be accelerating. Formalizing one leg of their monetization strategy: If you assume that only 15% of the businesses that have claimed their listing participate in the “Tags” enhanced listing product, it will generate over $180 millions annually in just the US. As part of this rollout Google also re-introduced their Service Area feature that was rolled out earlier in the month. This feature really has to be understood as part and parcel of their monetization strategy rather than part of their relevance or ranking algos. Rolled out several Google Places (LBC) features: Google is formally embracing KML, QR codes and attempting to make creating a business map more obvious. These endorsements are significant in their own right. The broadspread adoption of QR codes could bridge the mobile and business marketing worlds accelerating uptake of both. Over the past few years, Google’s development pattern has been to upgrade their Maps product and then rollout additional features in rapid succession. I believe that this could very well be the case here. Cathy Rhulloda created this video using the Google SearchStories feature on YouTube. Search on, indeed. I love Google Maps even though it seems that most every day with Google Maps is a Good News, Bad News sort of day. Do you want the Good News first or the Bad News? The Good News is that Rogers, MN, the poster child for lost Google towns, has found its rightful place in the pantheon of American towns…it is once again visible on Google Maps after being missing for 27 days and some odd hours. The police, fire department and Cabelas can all be found and life can once again return to normal. Like Rogers, Imperial Beach Ca can also now be found. The Bad News? Wickliffe Ohio and Woodstock VA are still counted amongst the missing. How do you make the Map a place of business? Need to move from lack of information, to information, to actionable information. If you have any doubt about Google Mapping ambitions be sure to watch the chronological video of Street View driving to date at 12:08 into the movie. Google clearly sees Mapping as the place where business will take place going into the future.